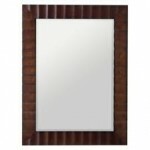 Target.com offers this Home 17″ Wood Wall Mirror for $20.99 plus $9.34 for shipping. Sales tax is added where applicable. Features include Silvertone hardware, Mahogany finish, three hanging pegs, mounting hardware, and more.